Although Daniel Everett was a missionary, far from converting the Pirahas, they converted him. He shows the slow, meticulous steps by which he gradually mastered their language and his gradual realisation that its unusual nature closely reflected its speakers' startlingly original perceptions of the world. 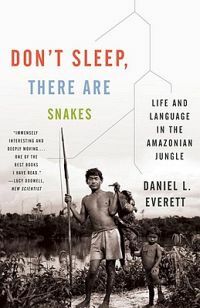 He describes how he began to realise that his discoveries about the Piraha language opened up a new way of understanding how language works in our minds and in our lives, and that this way was utterly at odds with Noam Chomsky's universally accepted linguistic theories. The perils of passionate academic opposition were then swiftly conjoined to those of the Amazon in a debate whose outcome has yet to be won. Adventure, personal enlightenment and the makings of a scientific revolution proceed together in this vivid, funny and moving book. Wow, this book was such an interesting read! I'll admit it lost me occasionally when it went into the very technical linguistic arguments and different theories (I skipped over a few of the pages). But the underlying story-line is completely amazing. Most especially because as I read I could often hear our Chinese carriage attendants chatting away. Chinese and Piraha are both (apparently) tonal languages. Either way, Chinese is not a language I am often exposed to and I'll admit initially I found it quite hard to listen to. I'm getting used to it now, but really it does sound so completely foreign to me. Anyway, if you're happy to skip over some of the pages (if necessary), I'd definitely recommend it, I loved it.